Poet In A Pub was created for Creative Arts East. Henry visits a venue, either library, cafe, pub, restaurant or similar space, and sets up a residency for a few hours, a day or more. The locals are welcome to come, chat and request a poem on any topic they choose. 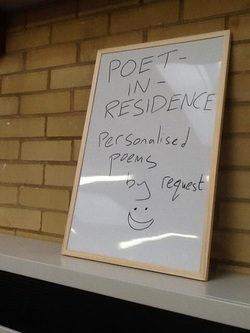 The residency has been delivered in a number of formats, and is an accessible format which allows people to engage with arts who might not normally come across poetry or spoken word. Lyn Garnder mentioned the concept in her blog which can be found here. "Really enjoyed the evening. Dynamic delivery of amusing and thought provoking poems. Thank you." "Love my poem was so how it was and brings back really good childhood memories." "Enjoyed very much especially poems written for specific people/events." "Different from my concept of what I thought poetry reading would be. Entertaining." "Very thought provoking! Unexpected in a pub!" "Had no idea what to expect! Brilliant entertainment!" "Very inspirational, a challenge to get people to recognise poetry as an artform"